High value ash trees are candidates for treatments for emerald ash borer. This factsheet addresses some of the most frequently asked questions regarding the treatment of ash trees for emerald ash borer (EAB), and the removal and disposal of infested trees. When should I consider treating my ash tree for EAB? Based on current research, EAB treatments are suggested only for ash trees located within 15 miles of a confirmed EAB site, or for trees located within a quarantined area. Insecticide treatments are not necessary for ash trees located outside of these areas. Even within the 15-mile radius, not all trees should be treated. Due to the expense of insecticide treatments for EAB, consider the value of a particular ash tree in relation to insecticide treatment costs before making any treatments. Proper use of EAB insecticides can help maintain the health of high value ash trees over time. Lower value ash trees are not ideal candidates for EAB insecticide treatments. How do I know if my ash tree has value? Ash trees can be a valuable part of the landscape. A properly cared for ash tree can increase property value, provide environmental benefits such as runoff and erosion mitigation, and reduce electricity costs by shading a home. Determining tree value can be subjective. Qualities to consider when assessing value include (but are not limited to) a tree’s overall health, shape, location with respect to landscape design, and appearance through the seasons, as well as whether or not a tree provides shade. A healthy ash that is properly located in the landscape, has a nice shape and good fall color, and provides shade has value. An ash tree that is not healthy due to disease or insects, has poor shape or structural damage, is otherwise unattractive, or is in a bad location (e.g., near a power line) is of lower value. How do I know if there are ash trees in my area that are infested with EAB? The Wisconsin Department of Agriculture Trade and Consumer Protection (DATCP) keeps track of EAB infestations in the state. Visit the Wisconsin DATCP Emerald Ash Borer Resource Guide website (http://datcpservices.wisconsin.gov/eab/) and follow the “Where has EAB been found?” link to access an up-to-date list and map of EAB infested counties and municipalities. You can also contact your local county UW-Extension office to see if EAB has been found in your area. How do I know if my ash tree has EAB? Symptoms of an EAB infestation can include canopy thinning starting in the upper portion of the tree, epicormic sprouting (i.e., formation of sprouts) along the trunk, bark splitting, and woodpecker damage. These symptoms indicate general tree stress, and can be due to EAB. However, they also can be caused by diseases or insects other than EAB. Specific signs of EAB include D-shaped exit holes (~3/16 inch wide) in the bark of the tree, S-shaped larval tunnels and/or larvae (cream colored, up to 1½ inches long) beneath the bark, and adults (metallic green, ~3/8 inch long). Visit the UW-Madison Emerald Ash Borer in Wisconsin website (http://www.entomology.wisc.edu/emeraldashborer) for additional information on the symptoms and signs of EAB. If you suspect an EAB infestation, call the Wisconsin EAB Hotline at 1-800-462-2803. If I decide to treat my ash tree, will I have to treat every year? In most cases, yes. Most insecticides registered for EAB management require yearly applications to effectively protect a tree. The one exception is TREE-äge (active ingredient = emamectin benzoate), which can protect a tree for at least two years. TREE-äge is a trunk-injected insecticide available only to professional insecticide applicators (e.g., certified arborists). TREE-äge can effectively protect an ash tree if the tree is treated every two years. Can I treat an ash myself or do I have to call an arborist? If your ash is smaller than 47 inches around the trunk at chest height [i.e., 15″ diameter at breast height (DBH)], you may be able to treat your ash tree yourself. University of Wisconsin Pest Alert XHT1181 (“Homeowner Guide to Emerald Ash Borer Insecticide Treatments”) provides a list of products currently available for homeowner use. If you decide to treat your own trees, be sure to read and follow all label instructions of the insecticide that you select to ensure that you use the product in the safest and most effective manner possible. 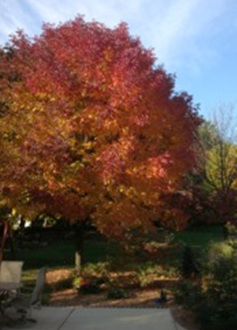 In some situations, hiring a certified arborist to treat your ash tree may be more desirable. Professionals have access to specialized application equipment and additional insecticides not available to homeowners. They are also trained to measure trees accurately, and assess the overall health of trees. 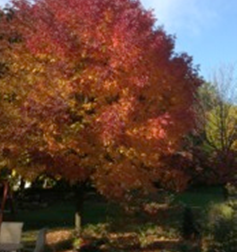 The Wisconsin Arborists Association website (http://www.waa-isa.org) has a list of certified arborists in the state. Note that the University of Wisconsin does not endorse any insecticide products, and does not recommend any professional products over those available directly to homeowners. Am I allowed to treat an ash tree in my yard between the sidewalk and street? The answer to this question varies from municipality to municipality. In many cases, municipalities have treatment or removal and replacement plans already in place. Contact your local town, village or city to determine an appropriate strategy for protecting your sidewalk trees. How much does it cost to treat an ash tree for EAB? A single tree that is 32 inches around at chest height (approximately 10″ DBH) can be treated with a granular or soil drench homeowner product for about $20-35/year. Arborist treatment costs vary depending on tree size and location, the insecticide selected, and the application method. Other arborist-specific site visit charges may apply as well. Consult at least two arborists in your area to discuss treatment options and costs. To make an accurate comparison among service providers, make sure you know what insecticide will be used, the method of application, and how often treatments will be made. An arborist will not be able to determine the exact cost of treatment for your specific ash tree without a site visit, but an arborist should be able to provide you with a cost estimate for a typical ash tree. Do I have to remove my ash tree if it is infested with EAB? Applying protective insecticide treatments to a healthy ash tree to prevent an EAB infestation is the best strategy for managing EAB. However, if a tree becomes infested and the infestation is detected early, you may be able to treat your ash tree to prevent further damage, and help the tree recover. Research suggests that insecticide treatments are significantly more effective on EAB-infested ash trees with less than 50% canopy thinning. Insecticide treatments are not recommended for trees with greater than 50% canopy thinning; these trees should be removed. Trees that become infested with EAB and are not treated will ultimately die and will need to be removed. How much does it cost to remove an ash tree? Typically, a small (less than 25 feet in height) ash tree may cost a few hundred dollars to be removed by an arborist. Larger trees may cost $1,000 or more to be removed. Individual factors (e.g., the proximity of the tree to structures, power lines, or other hazards) can significantly increase the cost of removal. Tree removal costs also may vary from location to location in Wisconsin. Ultimately, removing recently killed trees while they are structurally sound, rather than allowing them to deteriorate, may be safer and more cost effective. How do I dispose of wood from an infested ash tree? If you choose to remove an infested ash tree, check with your municipality to see if a wood disposal or utilization program is in place. If you have a tree removed by a tree care service, the service may be able to handle the disposal of wood from the infested tree. If you decide to use wood from an ash tree for firewood or other purposes, use it locally. Transporting infested wood risks spreading EAB elsewhere in the state, and may be in violation of Wisconsin’s EAB quarantine laws. Information about Wisconsin’s EAB quarantines can be found on the Wisconsin DATCP Emerald Ash Borer Resource Guide website (http://datcpservices.wisconsin.gov/eab/). For more information on controlling emerald ash borer: Visit http://www.entomology.wisc.edu/emeraldashborer, http://datcpservices.wisconsin.gov/eab/index.jsp, or http://www.emeraldashborer.info, see University of Wisconsin Pest Alert XHT1181, or contact your county Extension office. For a video demonstration of treating your ash trees using a systemic drench, visit http://www.entomology.wisc.edu/new-video-protecting-your-tree-emerald-as….